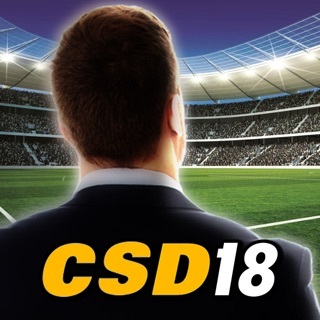 Football Manager 2019 Touch is the streamlined way to experience life at the helm of the world's greatest football clubs. If you're bursting with ambition but short of time, then this is the Football Manager for you. There are 116 leagues and 51 nations to setup home and for the first time that includes a fully licensed Bundesliga and 2. 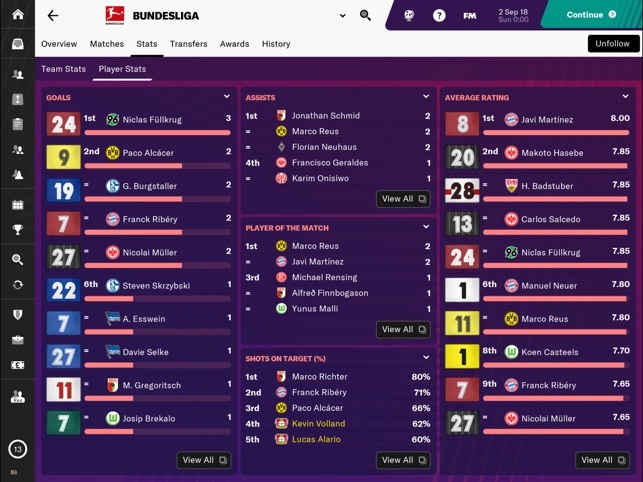 Bundesliga. Your role may be streamlined, but your choice of club is certainly not. 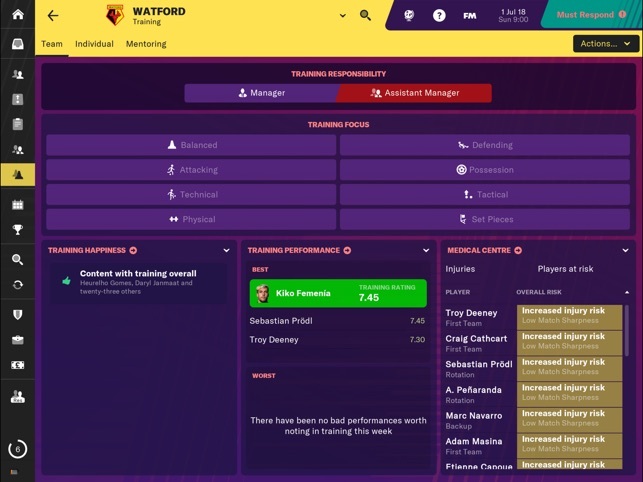 Even Match Days can be accelerated with an ‘Instant Result’ feature that will see you smash through the seasons on your way to domestic glory, and beyond. If you’d prefer to see your tactical vision come to life, then you’ll take in your games on the acclaimed 3D engine – which now benefits from goal line tech and VAR. 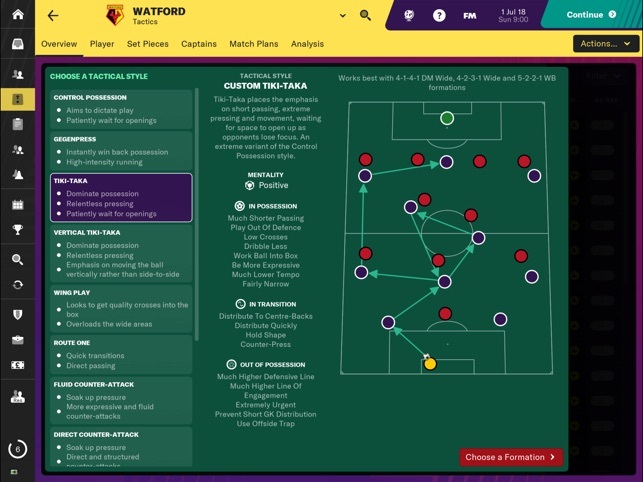 FM19 Touch also includes a host of unique management challenges, dropping you right bang in the middle of a tense relegation battle or a squad crippling injury crisis. How will you handle it? Kick start your managerial career with a primer on the management fundamentals, designed to guide and elevate new managers towards success. Take a ready-made path to success with new tactical pre-sets including ‘Gegenpress’, ‘Tiki-Taka’ and ‘Catenaccio’ or use the new tactical creator to craft something unique to you. 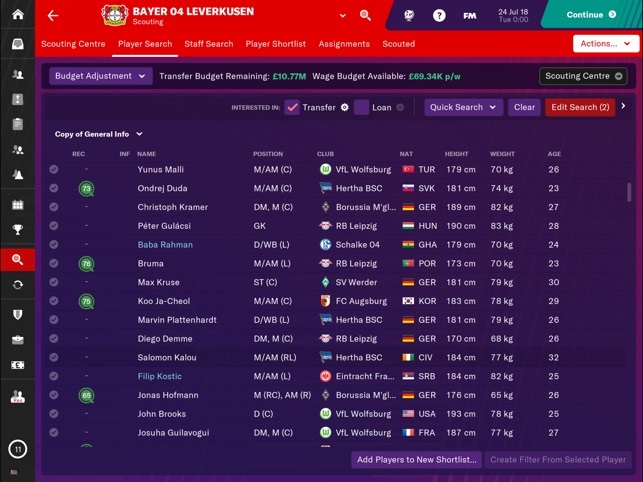 The top two divisions of German football make their debut in Football Manager 2019 Touch, which means that both the Bundesliga and Bundesliga 2 feature official club badges, kits and player faces as well as their respective trophies. 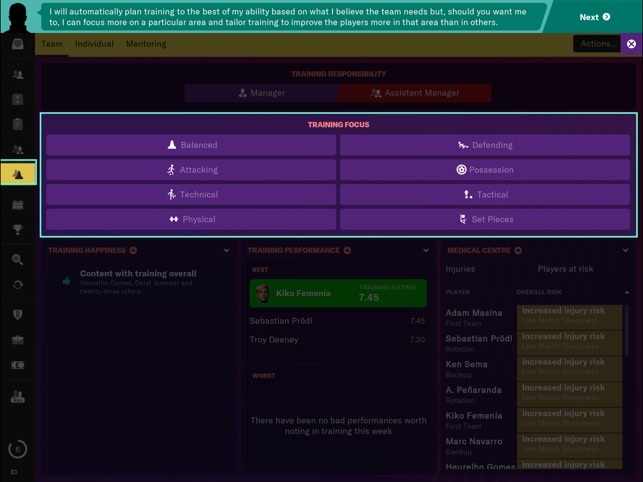 The revamped training module is not only fresh and simplified, but is also a realistic representation of how clubs develop younger players and prepare the first-team for individual fixtures, and the season ahead. 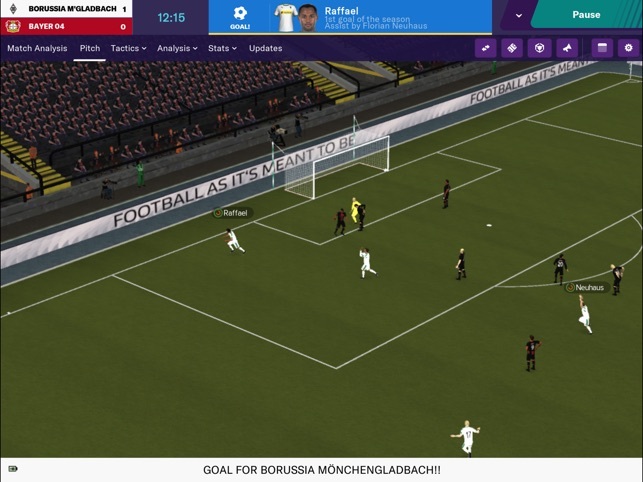 A fresh lick of paint and a host of small, but meaningful changes ensure that FM19 Touch is the best-looking version of the game ever made. This game may serve "Interest Based Advertising" and may collect geo-location data (please see http://www.sega.co.uk/Privacy for more information). This could be an amazing game has almost everything you want but it is impossible to sell players and to buy players. it's super expensive when you're buying a player you always have to pay more than he's worth sometimes 10 times more than he's worth but when you sell a player even when teams are interested but nobody makes an offer and if they do make an offer it's for a fraction of what he's worth this is ridiculous. Please can you guys make at least something a way to make this easier and more realistic. I have one of the best players in the world and I can't trade him for a player who is worthless makes no sense they want my player plus ridiculous amount of money. 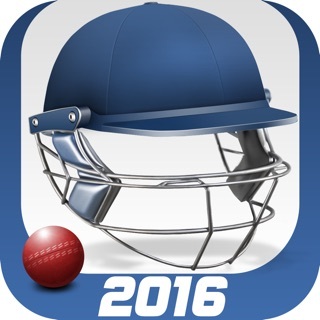 If you can fix theses issues then I can recommend this this game to my friends. Hi there, the 18-year old wonderkid you're trying to sign is probably attached to a big club on a long contract. When you are in negotiation and proposed a large fee, this is because the club are in no position to sell - it's very realistic. Look at the fees some clubs are having to pay for the brightest prospects. I win. I lose. I am never sure why. I buy three- and four-star players who then play like one-star duds. I rest them. I play them in the roles they are most suited. I still cannot predict how they will play. Yes, players can be inconsistent IRL, but not like this. Changing formations and tactics have some vague influence on the outcome of games. But good luck understanding how or why. My players bang passes and interceptions around like they are playing volleyball with their heads. Five or six headers in a row, including the opponent. Who does that? Actual players bring the ball to the ground where they can control it. I appreciate the completeness of the teams/leagues. In Scotland, for instance, FM has four levels, which allows for realistic promotion and relegation. EA Sports’ FIFA, meanwhile, has just the Premiership, so no promotion/relegation. I appreciate that the team’s board can expand the stadium to match the success of one’s team. 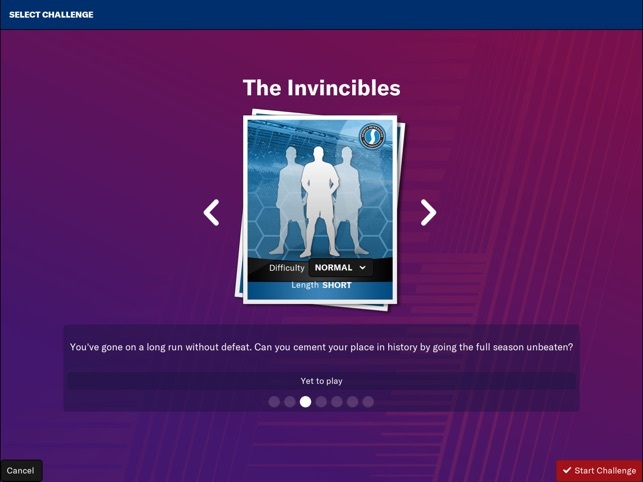 Meanwhile in FIFA I can eventually win the Champions League with Ross County, but the Staggies will still be playing in a not-sold-out 6,000-seat stadium. I’ve played touch on the iPad for a while, this version tried too hard. It seems this version was rushed and too much was focused on the presentation. It only gets 3 stars because of the depth of the game. The interface is buggy and there are simple things missing such as when a scout returns his report, you have to go find the report instead of a link being in the email. In the tactics screen, the team will be different when it gets expanded. Seems this version wasn’t quite ready. Requires iOS 10.0 or later. Compatible with iPad Air, iPad Air Wi-Fi + Cellular, iPad mini 2, iPad mini 2 Wi-Fi + Cellular, iPad Air 2, iPad Air 2 Wi-Fi + Cellular, iPad mini 3, iPad mini 3 Wi-Fi + Cellular, iPad mini 4, iPad mini 4 Wi-Fi + Cellular, 12.9-inch iPad Pro, 12.9-inch iPad Pro Wi-Fi + Cellular, 9.7-inch iPad Pro, 9.7-inch iPad Pro Wi-Fi + Cellular, iPad (5th generation), iPad Wi-Fi + Cellular (5th generation), 12.9-inch iPad Pro (2nd generation), 12.9-inch iPad Pro Wi‑Fi + Cellular (2nd generation), 10.5-inch iPad Pro, 10.5-inch iPad Pro Wi‑Fi + Cellular, iPad (6th generation), iPad Wi-Fi + Cellular (6th generation), iPad Pro (11-inch), iPad Pro (11-inch) Wi-Fi + Cellular, iPad Pro (12.9-inch) (3rd generation), iPad Pro (12.9-inch) (3rd generation) Wi-Fi + Cellular, iPad mini (5th generation), iPad mini (5th generation) Wi-Fi + Cellular, iPad Air (3rd generation), and iPad Air (3rd generation) Wi-Fi + Cellular.